Water Wall Berms, also known as spill berms, are Drive-Through Berms used for decontamination emergency response applications. These berms are made from reliable containment materials and feature walls made from water. 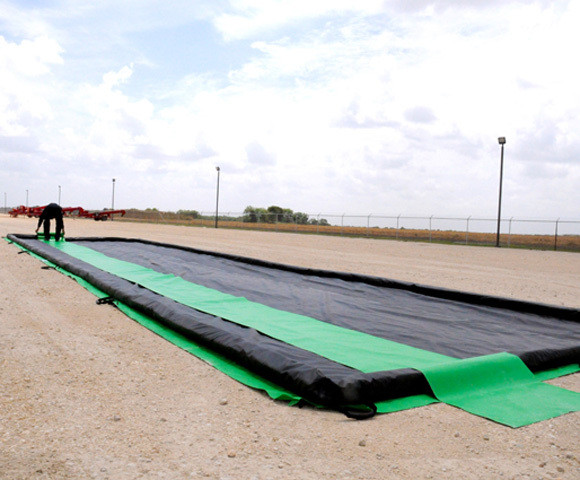 This has allowed these spill berms to be used in applications that require fast setup, installation or response. This Water Wall Berm is made from your choice of PVC or Urethane material and contains soft sides that are filled only with water. Helping to keep the form of this barrier, corners are filled with a hard pipe to help keep the water walls in place during their use. This construction provides a soft surface that allows vehicles to be driven directly onto the structure. Aluminum Angle Berms: The aluminum angle spill berm shown here features an easy fold down side that allows vehicles and machinery to be driven directly onto the unit. 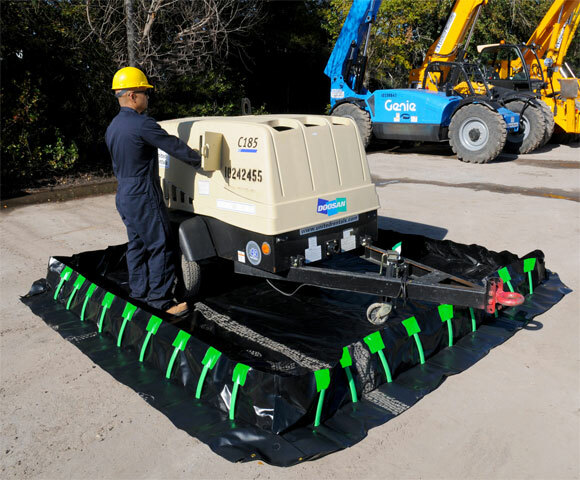 This is ideal for applications or areas that require a firm containment barrier. Foam Wall Berms: Similar in nature, the foam wall berms are designed with a drive through ability that allows the foam walls to bounce back after being driven over. Air Wall & Foam End Berms: As a combination, we also offer a secondary spill berm that contains both air walls and foam ends. This mixing of foam and air structures helps to provide strong and high side wall barriers, while still providing a low profile entrance for entering vehicles and machinery. For further information regarding spill containment requirements, please review the EPA Secondary Containment Regulations.